We’ve had a busy couple weeks at the Party Girl, but with everything going on behind the scenes we wanted to share some of the fun we’ve been having away from the computer, especially when that fun means collecting some super fun (and easy!) cocktail ideas to share with friends! I was super lucky to work with a talented friend developing a carnival-themed beverage menu for a project recently, and we got to play with some old school crafts and make this fun backdrop for our beverage station. And since we were already doing all that cocktail research, why not share some of our favourites for throwing your own carnival (or circus!) themed party? Plus today is Thursday, so why not start a mini-tradition and share some Thirsty Thursday inspired recipes for winding down after a long week?! We won’t bore you with all the reasons why they’re carnival themed (it involves a lot of weird stuff about flavours and taste buds and pairings) but the names are cute and the recipes are delicious so just enjoy! We stumbled across this gorgeous little recipe on A Cozy Kitchen and instantly were awed by that stunning presentation, and then we saw chamomile and bourbon and fell in love. Boil your water and pour it over your tea bags in a large container. Your life will be a lot easier if you have a jug with a pour spout. Add honey and bourbon and let it all steep for a bit (until you get the colour/strength you prefer). Shake everything in a shaker and pour into super cute mason jars (or whatever you’d like!) 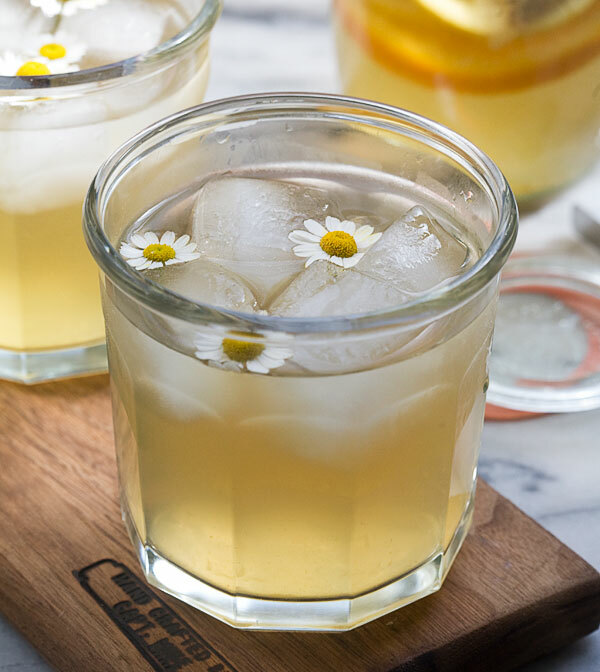 and garnish with fresh chamomile flowers to show off to all your friends! How stunning is this super simple cocktail from Mirabelle Creations, PERFECT for a carnival party? Combine the classic carnival snack of cotton candy with some Barefoot Bubbly Prosecco for a crisp and inviting sparkling taste and a fun candy-sweet finish! And it’s so easy! Just pour the champagne over your cotton candy and watch the magic happen! These cute little cocktails are just begging for some gold garnish, like the washi tape stems pictured above, or make some glitter stir sticks and serve! And how sweet are those watercolour and calligraphy name cards? The whole thing is just perfect for a girls night, carnival theme or not! Every party needs some non-alcoholic options for the DD, and this perfect little mocktail smoothie from Nosh My Way is delicious AND adorable! It’s a velvety blend of puréed strawberries, pineapple juice, a splash of club soda, and a light topping of whipped cream, so basically it’s the best kind of smoothie ever. Plus the colour comes out super bold and gorgeous, so it would look great with some circus themed black and white paper straws and highball glasses! Want to make them even better? Why not try making some gold tinsel stir sticks like these New Years champagne stirrers!? They look so chic below but paired with some fun circus straws and that bright fruity red, I bet they’d be just as great! So that’s that! Three of our favourite cocktail/mocktails to try yourself over the weekend and brighten your day! We have some exciting projects coming up next week for Easter (think pretty decor and yummy treats!) but there are even bigger changes coming to the Party Girl soon so I hope you’re following us on this adventure!